Medicare's annual wellness visits are less likely to occur at physician practices with low-income, medically complex patients, a new Health Affairs study finds. The CMS introduced the annual wellness visit in 2011 under the Affordable Care Act to promote prevention and wellness among the Medicare population. Yet practices with high-risk populations adopted the practice at a rate of 18% compared with practices with low-risk patients who completed the visits at a rate of 23%. Additionally, practices with many dual-eligible patients, those who qualify under Medicare and Medicaid, billed Medicare for annual wellness visits at a rate of 17% versus practices without such a patient mix, which billed Medicare at a rate of 26.5%. The reasons for lower adoption among practices that treat medically complex patients is likely twofold, said Dr. Ishani Ganguli, lead author of the study and a primary-care physician at Brigham and Women's Hospital in Boston. Physician practices with a high population of dual-eligibles and low-income patients might lack the resources to focus on the visits, she said. The study found that rural practices that disproportionately care for minority and low-income patients lag in EHR adoption, which can make it difficult to report and track the visits. At the same time, clinicians who serve underserved populations typically have greater workloads because they struggle to attract and retain staff. Meanwhile, patients with such social-risk factors such as food insecurity are less likely to prioritize preventive services because they have compounding concerns, Ganguli said. "I take care of a wide range of patients, and I have patients who experience a lot of medical issues and financial issues in their home environment. For them to spend 40 minutes focused on cancer screening feels like a distraction (to them)," she said. A tactic to promote increased adoption among practices could be to amend the annual wellness visit so it's less "prescriptive," Ganguli said. Practices must complete several requirements in order to bill Medicare for an annual wellness visit. "It is hard to truly do an annual wellness visit without doing it on purpose," she said. Ganguli and her co-authors suggest Medicare amend the visit requirements so they are more flexible for practices to complete and bill for. They also recommend an annual wellness visit specifically for medically and socially complex patients. A caveat to the annual wellness visit is that it's not yet clear if they improve patient outcomes. The study doesn't flesh this out either, but it did find practices that adopted annual wellness visits experienced an increase in revenue and more patient loyalty to the practice. A stronger patient-physician relationship has been associated with improved outcomes because doctors are able to establish patient plans and routinely follow up with those patients. 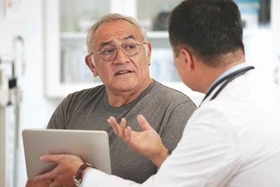 "The arguments in favor of annual wellness checkups in general have centered around the patient-doctor relationship, and I do think there is some truth to that," Ganguli said. Overall, 18.8% of eligible Medicare beneficiaries—or 6.2 million patients—received the annual wellness visit in 2015, which shows that although the visits haven't been widely adopted, they have been rising at a steady rate since 2011, Ganguli said.